There are funny marks around my eyes (where the green arrows are) when I put on some eyeshadows and I can't get rid of them. Does anyone know what I've done wrong and how I can fix it please? Blend your eyebrow slider and your blush slider on your head's hud. Skell should be along soon with proper instructions. You need to use both layers. The eyeshadow goes on the eyes and brows layers, so apply them to the lower layer first. 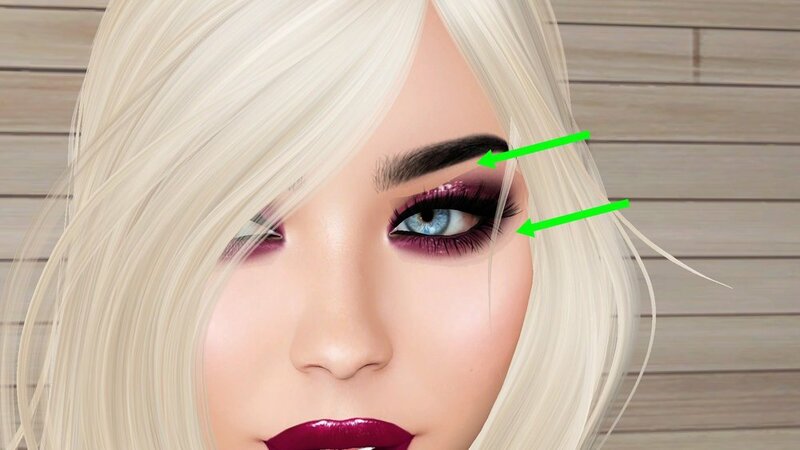 Then, add your eyebrows to the upper layer to put them on top of the makeup - you may have to put them on the lower layer first and save them to your HUD to apply them from there, as many makeup appliers apply to the lower layer by default. I need my own Batsignal! @JessicaJenni, assuming you're using a Catwa Bento head, the instructions differ depending on whether those are applier brows or not. I'm not logged in right now, but I have a video that may help you. Click here to view it, after reading the below instructions. With the 'lower' button checked on the Brows tab of the Master HUD, click one of the black 'save' buttons in that section. You'll either see the word 'empty' disappear from the box above it, or an icon or logo might appear there (example, the black brow showing on my HUD in the video). Apply the makeup. Check the blend slider on the Blush tab of the Master HUD. It should be all the way across to the left. If it is, and you're still seeing those missing sections of eyeshadow, push the slider all the way to the right and then back to the left again. That will usually trigger the texture into rezzing properly. Also, check the blend slider on the Brows section. You should now be layered correctly. If they're not applier brows, then you've very likely tried another applier that's gone onto the brow section of the head. (For a great visual of where the areas are on a Catwa Bento head, check out this gif by a fellow Catwa CSR.) If this is the case - and the brows that you currently have on are painted onto the skin rather than separate appliers - clear your eyeshadow and re-apply it. Then follow the instruction in step 4 above, to check the blend sliders on the Blush and Brows tabs of the Master HUD. If those tips don't work, then come back and post again to let me know what's happening when you try the above. Please note that I'm on GMT and will be going to bed shortly, so I might not be able to help you further until I get home from work tomorrow evening. I'll be logging inworld then, though, so I can contact you in IM if you need me to and walk you through some more troubleshooting. I tried everything you said and watched the video but it's still not working. I think the problem lies with the eyeshadow I'm using... it's "Pink Fuel - LAQ eyeshadow" and includes an Omega applier which is what I used. After doing steps 1-3, I applied the eyeshadow and (as you can see from the photo) it still looks odd. I tried moving the blend slider for the blush and eyebrows from right to left but it didn't fix it. I'm wearing a Catwa Catya head. I thought I could use this eyeshadow as I have the Omega Catwa relay HUD but maybe it's the wrong one for me? Omega just uses the SL UV it says nothing about area covered... this looks to me like the area taken up by the makeup is simply bigger than the area your head intended for eyeshades. Maybe reapplying it to cheeks and eyebrows to get it's full extend onto your head will work. Even though the makeup is designed and optimised for another head, if it has an Omega version it should still look fine on your Catya head. The issue is definitely with the brow and blush sections: that much I can tell from the parts that are missing. As Fionalein says, the eyeshadow goes onto those two areas as well as the eye area, so something is blocking it from working in those places. The brow area is the bit missing at the top and the blush is the bit missing at the bottom. Since you're not even wearing your applier brows in the image above, we need to figure out exactly what that 'something' is. Quick question: did you check the blend sliders with both the lower and then the upper parts of the head checked? 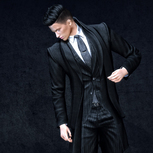 If you're inworld right now then look up my profile and scroll down the groups list until you see 'Catwa Head Friends'. That's the support group. It's free to join. There's only one CSR online at the moment, but hopefully she'll be able to help you if you ask about it in group chat, or some of the other group members might be able to help you fix it (they're a great bunch, and see us walking others through these fixes many times, so they know all the steps!) If not, then I'll be back home and logged inworld in roughly 12 hours from now. You guys are just wonderful! I'm logged out now but will try what you both said when I log in later. Makeup has been acting funny today..Makeup I use everyday is getting alpha glitchy and derezzing and all kinds of goofy stuff.. So it may just be the grid or sims acting up..